Having a Clear out in Chiswick? 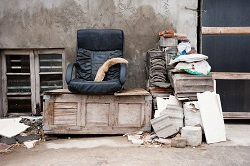 Try Our Furniture Disposal Services! When you are in time of Chiswick furniture removal from your home or office, there are lots of specific tasks to be taken care of, depending on how thorough you're being. Some of the most finicky items to move is the furniture. Furniture tends to be large and unwieldy, and can be a real pain to move as a result. Here at Rubbish Removal Chiswick, we specialise in home clearances, and can take care of the furniture disposal as well. The biggest problem with moving the furniture (especially sofas and tables) is their weight and shape. It's for this reason we dispatch a team of furniture collection professionals, who, thanks to their experience and technique can get the furniture out of your home in no time at all. If you're running a business that carries many different types of furniture (like an office or hotel), our furniture disposal services become even more useful. There is no task that is too large for our clearance staff. So what are you waiting for? Give us a call on 020 8396 7158 now if you need some furniture or other bulky items moving. There are a few ways that we handle the removal of furniture, and it depends on the condition. Pieces that are in fine condition get passed on to charitable organizations, and ones that aren't get recycled or reused. We handle furniture and sofa disposal in the most environmentally friendly way we can, so nothing simply gets thrown onto a landfill. There's better uses of the Earth's resources than that. All of our clearance packages are popular, and we've received a lot of positive feedback from our customers. One of the few reasons for this is our customer friendly style of business. 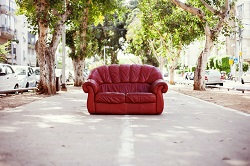 We offer furniture disposal in Chiswick for a low price, but not at the cost of quality of service. We provide the best service that we can at every opportunity, and that's a promise! The reason why we can provide the most affordable furniture disposal service in W4 is simple. We put our resources where it counts – into employing the finest furniture clearance staff around. They make sure that our service is efficient, and far more affordable than the alternatives. There's no need to hire a skip or a van of your own, because our service is not only cheaper and easier, it has the potential to benefit others too. Call us now on 020 8396 7158 and we'll help book an appointment that's convenient for you. There's no need to change your plans at all! So if you want to replace your old furniture with an updated set, or if you're looking to move home or office and don't plan to take your bulky items with you, there's an easy way to get rid of them. Just get in touch with Rubbish Removal Chiswick on 020 8396 7158, and we'll lend a hand. We provide a simple solution to your furniture and sofa removal needs, and can be at your home or place of business at short notice. If you're interested in furniture disposal service in Chiswick W4 or any of our other home clearance packages, our friendly call centre staff are here to take your call!